The "Take It!" came from my having parked my car facing a very large truck that was staged in an alley while they were making deliveries to the objective hotel. This is a frequent situation as I go through the work day. I find places to quickly park with the understanding that I will only take a few minutes before returning to my car and be on my way. I rarely have had any difficulty with the drivers of blocked in vehicles. Some are getting to know me as I present myself in a friendly fashion to almost all that I encounter. The big reason for taking this photo, was to have the chance to explain a little part of my day. What I did not realize when taking the picture was how not by design, the circumstances brought in other visuals. 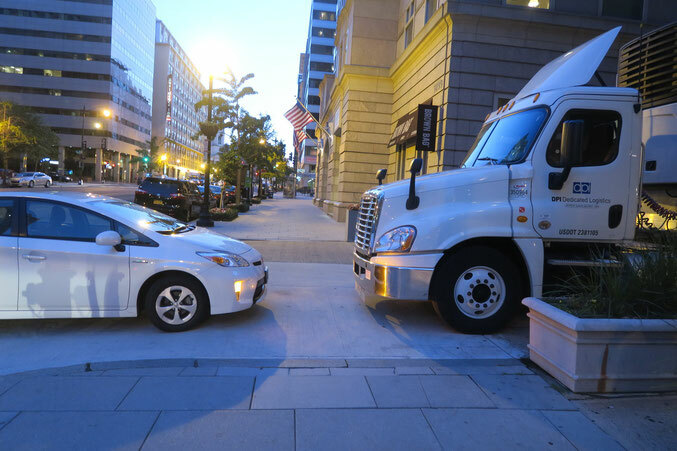 The big one was to show how important it is to give pedestrians a chance to get around one's vehicle, especially when illegally parked. I had parked the car in this location as the other availabilities offered long walk, time consuming situations. What I did not see when I took the shot was how the optics of the street with it being lined on either side with medium high buildings, would serve as a mini infinity shot. The After Take: I had fun showing this pedestrian shot to that great group of locals that give me quick feedback on what they see in my work. I initially introduced the photo as being " My car picking a Fight " in a back alley. Everyone thought that was funny and almost all laughed out loud. After having shown it enough with this introduction, I began to see there was some, by chance good stuff in the composition of how everything lined up. As this began to reveal itself, I added this as commentary when showing the photo, and the story telling became a richer experience, for both myself as well as the other viewer/listener. The grand part of this picture is how many observations and other eyes can help us better portray a story. Here is hoping you have a wonderful day. PS: It must be noted, that when Taylor is working with me, we are able to make even closer temporary parking situations work, for at an instants notice we can re-position with a short move. We are deferential as often as possible, for know some of these folks are on a very tight schedule. What caught my eyes were the shadows cast by the cars, very neat. I love the lighting you captured here. My husband and I were just talking about it. Beautiful picture! I love your car too, you are part of the solution. You have the exact same car as Teri. My teacher friend that introduced me to the site. Hey that's my car, same model and color. You sir, have excellent taste! Thanks to everyone for your comments. You have found things I did not notice. The shadows of both the cars as well as the hydrant were very cool. I bought the 2015 Toyota Prius in November and have 30,000 miles on it already. It is a great car and gets great gas mileage. I can recommend it to anyone. Taylor is back doing a great job of driving once again which has made life far easier. Life is very good and thanks again for all of your interest and comments - they mean a lot to me.